The Hawaiian Airlines float carried the Aloha Festivals Royal Court, with Gerard Counselor walking beside the float, at the parade's starting point at Ala Moana Park last year. 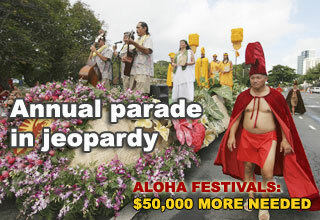 The parade continues down Kalakaua Avenue through Waikiki and ends at Kapiolani Park. **Associated Press videos are not available due to technical difficulties. » Under the Sun: Agree to call Obama hapa?